One Less Nemesis Blog: Cyber Monday!!! HEY PEOPLE! We are having an awesome one day only sale to celebrate Cyber Monday! 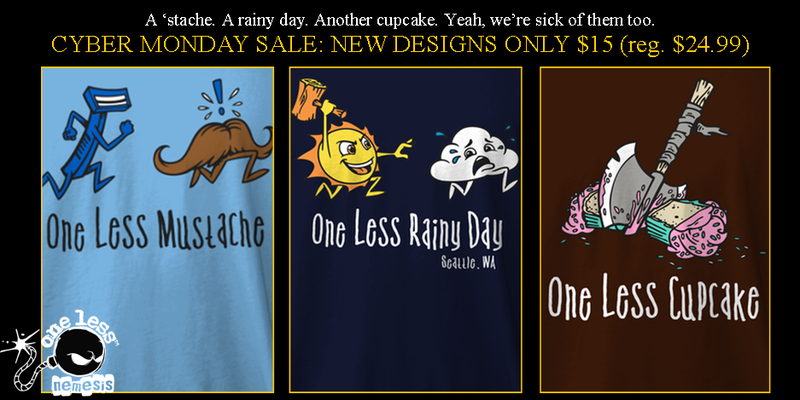 For Monday, November 26 only, our brand spanking new designs are $15 (discounted from $24.99!) What a great gift for the guy who's coming off of Movember, the Seattle-ite who is so sick of the rain or that person (like me) who has given up cupcakes due to the recent overindulgence! Order NOW! Hypable Contest and Green Friday Sale!